Cotton was the chief crop exported and was 60% of all exports. And likewise import tariffs via cotton producing states buying imports for plantation operations paid for most, if not all, of the government operations. While only having half the population as the North, the South, as King Cotton, was an economic juggernaut and hence, the South's economic consumption and production volume was far greater than the North. The reason being, American Cotton supplied 75% of the World's Cotton. With tariffs and a future political outlook that a successful business practice of Slavery that paid for the entire government operations would be abolished and, hence a form of "taxation without representation", the South saw their basic economic needs of survival were totally left out of the nation's political decisions. Hence, state by state, each voted to leave the union. If the South were allowed to secede, could not others states like in the West also secede and form a 3rd nation? Hence, if the South were to secede, why not the West? And what about the North, could not that also break into North West and North East? Hence, America would be like Europe having constant wars between themselves? Or like Africa, who also have constant wars over food and water among themselves? Nevertheless, the Civil was not about "Evils of Slavery" as the Slaves did really well and all of their basic needs were met as Cotton was King. That is, in 300 years of Slavery, the starting 388,000 slaves grew to become 4,000,000 slaves working side by side and raising healthy families generation after generation. Moreover, if the Slaves actually wanted to run away, it should be asked that if absentee plantation landowners existed before the Civil War, then the "masters" were never at the plantation. Hence, the slaves had ample time to run away. But isn't the Civil War about *not* creating another Africa or Europe where there are constant wars between the countries, or this case the States? In the Bigger Picture of History, a million dead from the American Civil War is nothing compared to many wars that had been going on in Europe and Africa for the past thousand years and also the foreseeable future. America was a very young country back then and a hundred years old is nothing compared to those in Europe, Asia or Africa. Furthermore, resources like food and water were far more important back then than it is Today in the Land of Plenty, e.g. our current ability to preserve foods for long periods of time, refrigeration, running water, bottled water, high tech farming, etc. Back then during the Civil War, you lived from harvest to harvest....There were no supermarkets, Sam's Clubs, MRE's, 911, electricity, Tupperware, refrigerators, ziplock bags, etc. If the South were allowed to secede and if there was a long Winter, there could easily be famine in the North where the North would pay massive prices for goods to be shipped up North. You could see chaos, rioting and mass migration like you see in Venezuela, Cuba, and Syria if food were in short supply. Accordingly, a study of History back 200 years ago can leave out the importance of food and water (and long Winters) that we take for granted in Today's Land of Plenty. 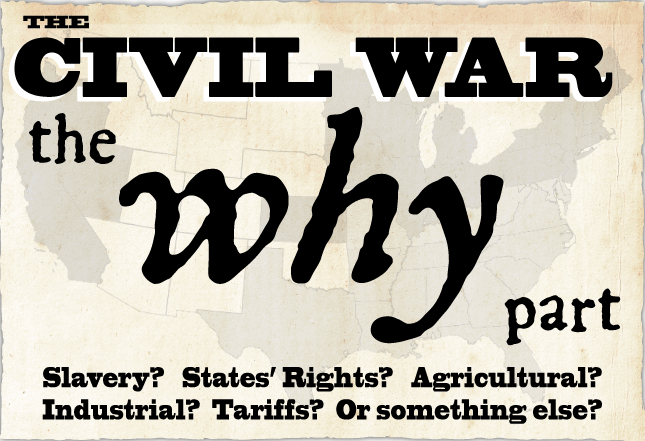 Besides the debated reasons about (a) Slavery and (b) Preserving the Union, some will say the Civil War was about money (or from one point of view, tariffs). 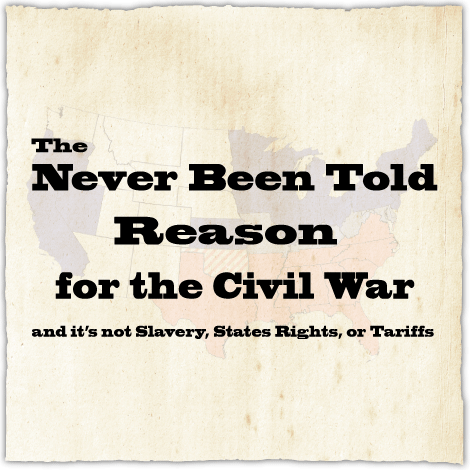 The Federal Government was funded with Tariffs on imported goods that the South would need as the South was not industrialized. However, from the North's Side, they could never, even to this day, allow the South to succeed for the two (2) reasons below. Reason #1 - The South had an enormous coastline on the East coast and South coast that connected to Europe and South America. 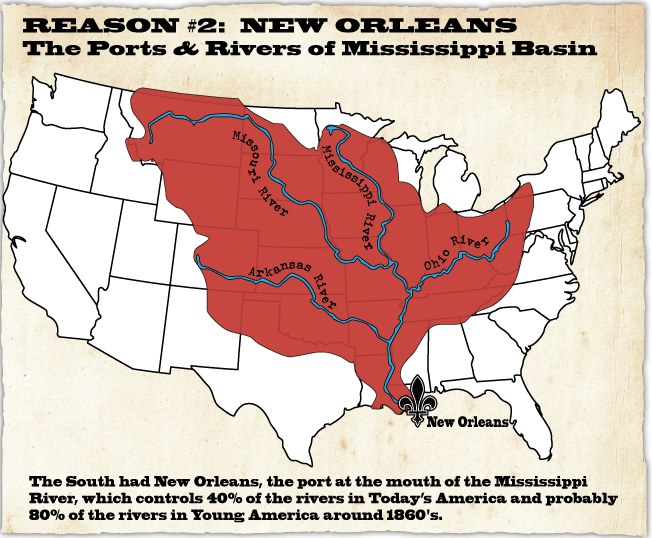 Reason #2 - The South had New Orleans, the port at the mouth of the Mississippi River, which controls 40% of the rivers in Today America and probably 80% of the rivers in Young America around 1860's. During the Civil War, food was near impossible to grow during the Winter and likewise, soldiers were dying of scurvy, i.e. the lack of Vitamin C....e.g. potatoes and onions and citrus fruits. Armys could not move and roads were impassible and so on. Armies basically encamped during the winter. 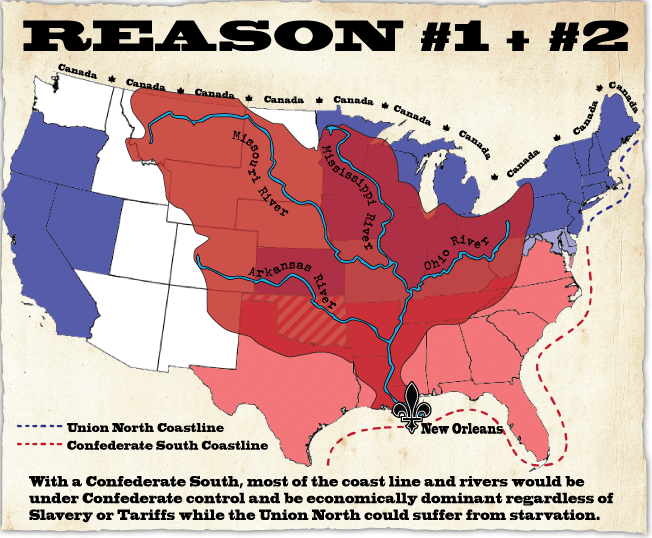 Next, as you can see from the above map, Reason #1 + #2, the North can never allow the South to secede even with the high cost of lives in the Civil War. The reason being the same cost of lives on the South could have easily been inflicted upon the Union North in a short amount of time just from a loss of critical infrastructure. could have easily been done, indirectly or directly, against the Union North in short order as the South would have control of most of the coastlines, waterways, and infrastructure in Young America. As for what Abraham Lincoln said (or what Jefferson Davis said), forget about it. What did Abraham Lincoln see? That is, "Where was America's food and water?" The North abolishing Slavery was a "divide and conquer" war tactic against the King Cotton South. That is, from the Bible, “If a house is divided against itself, that house will not be able to stand." Mark 3:25 NAS. The North had to do everything it could to economically destroy The South's agricultural power and that meant blockade of all the Southern ports and taking over all the plantations. And if that didn't work, it also meant ending Slavery to cause possible social unrest and dissension between Slaves and their Masters. The North abolished Slavery not "before" the Civil War started, but "during" the Civil War when battles were won or lost; hence the common wisdom that the Civil War was fought on moral grounds is false. want to secede from the Union." The North realized long before the war started that even freed Slaves with sharecropping could still one day in the future be just another set of plantation owners (sharecroppers) who still wanted to secede from The North. And if that happened, that would be really bad for The North survival in terms of food and water. 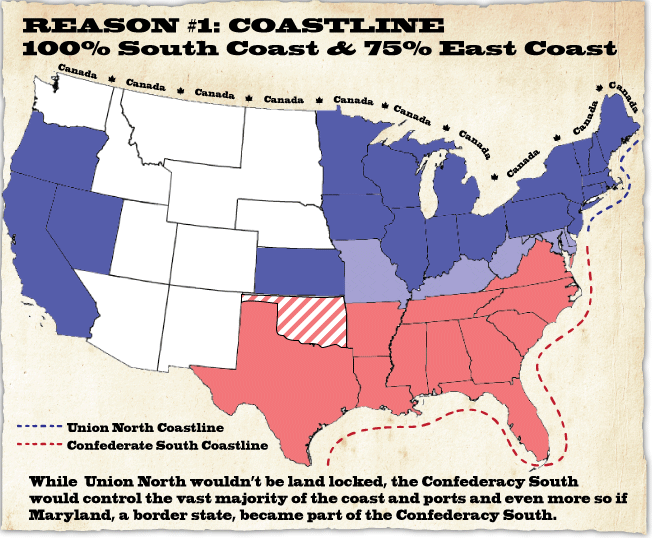 In summary, The North (and even Today) could never allow The South to secede as The South would control the vast majority of (a) "year-round" Warm Climate Farming Land and the vast majority of (b) coastlines, waterways, and rivers. There is the Legal World and there is the Real World. And in the Real World, it doesn't matter who said what, or what this paper said, or even what this law said. There is no way the North would allow the South to secede and control 80% of the coastline (and shipping ports) and 80% of the inland waters ways via New Orleans in young America. When the South rises again, do not let your greed overwhelm you (both Free and Slave, both White and Black, and both Rich and Poor) as it did with your forefather, King Cotton, or your Brothers from The North again will come down again and make war with you over food, water, coastlines, rivers and New Orleans as it did before. Honor the War Dead of the South as you would in any game of sport where you are the victor. Do not dance on their graves (schadenfreude) for they are your brothers and sisters of the South. You do not have to honor their succession from the union, but you should honor how bravely they fought and the sacrifices they made. Do make annual inroads, in both business and pleasure, with your brothers and sisters and work together using water, land and the rivers that connect you to create peace and prosperity for all of America. If need be, make laws to finance and promote a North and South business partnership and personal friendship that achieves peace and prosperity for a United States of America.